The Serenity | Casey Family Options Funerals & Cremations. 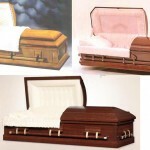 Includes basic service charge, embalming, other preparation, removal, transportation to/from funeral service, and one hour of visitation prior to funeral. Asphalt-coated sealed concrete container—a variety of colors available. Includes deluxe register book (choice of colors), your choice of prayer cards or memorial folders, memorial candle, 8 x 10 keepsake, and thank you cards.